A Customer set up with a Recurring charge in the Merchant Service Center is normally sent an email notification as to when the processed payment has occurred. The Merchant Service Center now allows for merchants to control whether or not a customer receives the email notification or not. 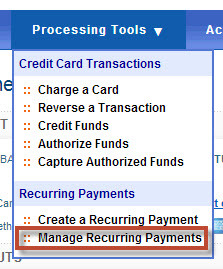 Step 1: Log into the Merchant Service Center, then go to Processing Tools > Manage Recurring Payments. Step 3: Click on Yes or No to change the option on whether or not you would like your customers to receive email notifications when charged from a recurring payment. Once a change has been made, green text will appear next to the Yes/No switch reading "Saved Setting" with a green checkmark. This confirms the change is complete.